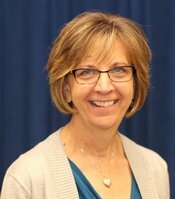 Lori Broady joined ESU4 Teaching and Learning Team in 2018. Lori has been involved in education for over 25 years in a variety of capacities including over 23 years as a Social Studies instructor at Johnson-Brock. Lori earned both her Bachelor's and Master's Degrees at Peru State College. Lori is married to Jeff, who farms near Johnson. They have three daughters and three grandchildren. Spending time with her family is very important to her and she is involved with a variety of church and community organizations. As a member of the ESU4 Teaching & Learning Team, Lori believes that education in the twenty-first century offers many challenges and opportunities. The responsibility of a Teaching & Learning coordinator includes support for teachers as they assess and facilitate opportunities for all learners to reach their full potential. Along with supporting teachers in their curriculum work, the T&L coordinator also has the responsibility to help teachers integrate technology, using it to aid instruction in critical thinking, problem-solving, communication and collaboration, and creativity, therefore creating a wonderful opportunity to inspire educators and learners alike.